Lineman Hardhat Sticker Decals - A sheet of 22 pcs! For Linemen! 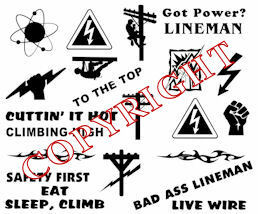 By popular demand, we have come up with a sheet of electrical lineman decals for your hardhats or what have you! Your choice of white or black die-cut decals...meaning only the vinyl will show...there is no vinyl background. Simply cut each element, peel away top layer and rub on your hardhats, truck windows, panel doors, toolboxes, etc. Have fun with these super cool decals!! The power poles are about 2" tall....that should give you an idea of all their sizes...YOUR CHOICE OF WHITE OR BLACK VINYL...MAKE YOUR CHOICE BELOW.